• Simple height adjust and rotate sample rod: provides sliding adjustment with locking screws to hold a fixed position. The range of vertical motion is 32 mm. Positioning accuracy is 0.5 mm (height) and 1 degree (rotation). 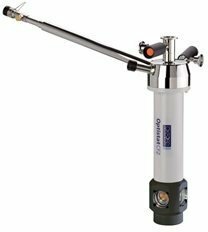 • Precise height adjust and rotate sample rod provides height adjust and with a resolution of 10 µm and a goniometer for setting the rotation angle with a resolution of 12 minutes. • OptistatCF with static exchange gas: the circulating cryogen does not come into contact with the sample. The heat exchanger is in good thermal contact with the sample space which contains an independent exchange gas (usually helium). The sample is cooled by conduction through the exchange gas. • OptistatCF with dynamic exchange gas: temperature stabilised cryogen flows into the exchange gas space cooling the sample directly. This version is recommended for large low conductivity samples or when large heat loads are applied to the sample. Also the cryostat can be used in single shot mode. The sample space is then filled with helium and pumped enabling a base temperature of 1.6 K for approximately 20 minutes (using an EPS 40 pump). • Oxford Instruments Low Loss Transfer tubes (LLT) use the cold gas exiting the cryostat to cool the shields surrounding the incoming liquid within the transfer tube. As a result, the consumption of our cryostats is the lowest on the market, dramatically reducing your running costs. • We can also offer an extra flexible transfer tube for those with restricted space in their labs. Please note that as this does not use the gas cooled mechanism, helium consumption will be higher than for the LLT range. However it will be well suited to those who need a lightweight and more flexible transfer tube. UV/Visible spectroscopy: Experiments at low temperatures reveal the interaction between the electronic energy levels and vibrational modes in solids. Case study: Dr Handong Sun from the Institute of Photonics (Glasgow) is using the OptistatCF2 to perform experiments of photoluminescence (PL) and PL excitation (PLE) spectra from 5 K to 300 K on dilute nitrides of III-V semiconductors and related nanostructures. The aim is to elucidate the electronic states and PL mechanisms in this novel material system.